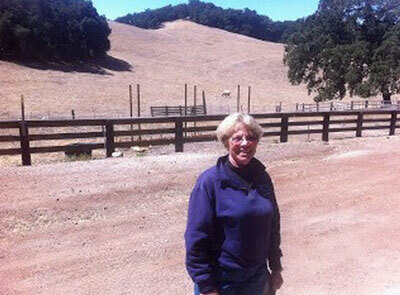 Paso Robles rancher Coco Collelmo. I do. I recently met rancher Coco Collelmo. She raises a small herd of grass-fed New Zealand Angus seven miles up Adelaide Road from our house in Paso Robles. Coco’s father started the business in 1959. In 2001, Coco met David Foss of New Zealand who brought a new breed of Angus to the ranch. They share a philosophy of cattle ranching based on sustainable farming and healthy food. They work with the land’s own resources, using superior cattle, managing stock humanely, feeding only fresh grasses, and never using antibiotics or hormones. These animals evolved over tens of thousands of years to feed on grasslands, not to be fattened up with corn and food by-products, like you find most places. We humans evolved to hunt and eat animals raised on the plains, not feedlots. I decided to look for more local, healthy alternatives for our family and to cut back on what the industrial food complex is selling us. So, last week I drove up a narrow dirt road to Coco’s Fair Oaks Ranch to pick up a quarter-share of steer. Her ranch is one of many community supported agriculture (CSA) programs in town. After the steer was cut and trimmed the yield was about 400 lbs., not counting the lard, organs, etc. Our share was 1/3 steaks, 1/3 roasts, 1/3 ground beef. It cost us $8 per pound. This was our second year and we doubled the order. Last year the supply lasted a few months. We should make it farther this year. Surprisingly, the 100 pounds of beef only uses about 4 cubic feet of space and fits well in our regular freezer in the fridge. 6. Grazing animals don’t need the large quantities of antibiotics that feedlot cattle do. 10. Grass-fed is more expensive, so you eat less. “The meat you buy in the store comes from cattle that have been fed corn, grain, or feed byproducts,” Coco says. Cattle that are fed in confinement are routinely fed high carb diets with low doses of antibiotics and added hormones to make them bigger, quicker. Their diet changes the composition of their fats from being high in omega 3, which is a natural anti-inflammatory, to being high in Omega 6, which does the opposite. Factory farms fatten their cattle in crowded feedlots where they sometimes get sick. Then the sick animals are forced into slaughterhouses with electric prods, forklifts and bulldozers. If you think you can stomach it, watch this video, Slaughterhouse Investigation: Cruel and Unhealthy Practices. I don’t really want to eat sick beef. Commercial ground beef is usually blended parts from dozens of these factory farms. This increases the chance the meat is contaminated with E.Coli or another pathogen. To prevent tainted meat, some factories add ammonia, according to a New York Times article. Mmm… tasty ammonia. Grass fed beef cooks faster. It stays redder in color even when it is medium temperature, so be careful not to overcook it. Because it is low in fat, I like to drizzle a little olive oil on my steaks to keep them from sticking to grill. With the ground beef I make burgers, tacos, meatloaf, meatballs and meat sauce. I love to add diced onion, garlic and fresh herbs like cilatro, parsley, dill and basil to my burgers. I’ll usually add a raw egg, some olive oil and a dash of hot sauce, too. The roasts I slow cook in the oven or crock pot with broth and vegetables.